This is the second of my recipes using Applewood Spreadable, be sure and have a look at the Kale, Pumpkin and Smoked Cheese Tart . I received a lovely hamper of ingredients along with some samples of Applewood Spreadable and one of the things in the hamper was a celeriac. Celeriac is a root vegetable with a slight celery flavour, it's delicious raw or cooked, but it's one of those vegetables I often forget to look for and buy. 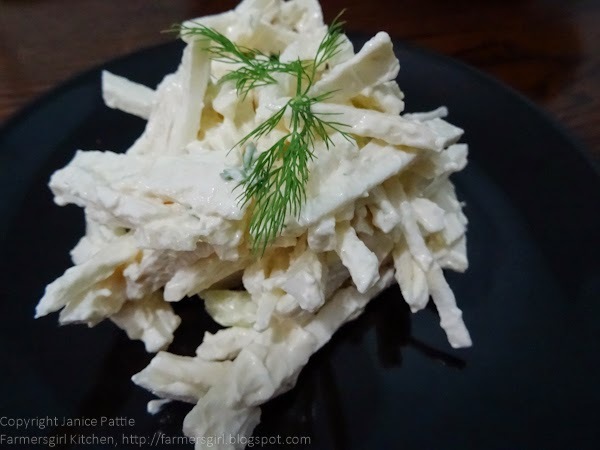 Remoulade is a classic way to serve celeriac, it's usually a mix of mayonnaise and mustard but I have adapted it to incorporate Applewood Spreadable and I found that the mild smoky flavour worked really well with in the dressing for the remoulade. 1. Mix together the celeriac and apple julienne strips with the lemon juice. 2. Make the dressing by mixing the Applewood Spreadable, mayonnaise and Greek yogurt, season to taste. 3. Mix together the julienne strips and the dressing, add about tsp of chopped dill and stir through. 4. Serve with cold meats, such as ham or cold roast beef or with any other dish where you would usually serve coleslaw. I received samples of Applewood Spreadable Cheese and a hamper of food products to use in the competition, I have not been paid for this post and all opinions are my own. Labels: Apple, Applewood Smoked Spreadable, celeriac, Celeriac and Apple Remoulade, remoulade, salad. 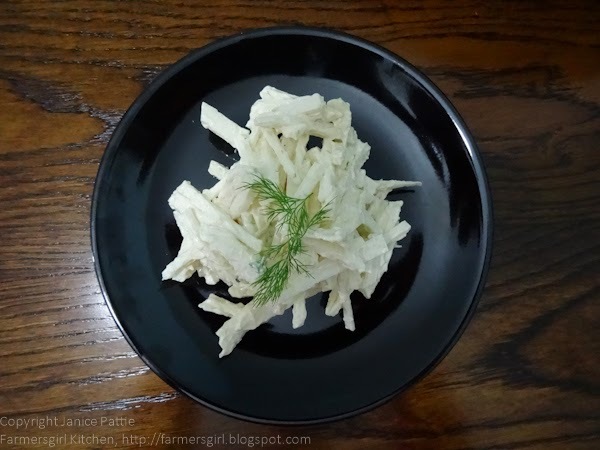 I love celeriac remoulade but have never made it myself. There was a celeriac in my veg box this week and was thinking of making it for the first time - now I am rather tempted by your version as I adore smoked cheese and can imagine that it would work rather well. oh man I LOVE celeriac and this looks superb. Love the cheesy aspect to it to. Gorgeous - also, have I said how sophisticated and good your photography has been recently, really fab! Antiona - Go for it! That celeriac is just waiting to made into remoulade. Dom - aw thanks honey, I try my best with the photography, gets harder to get good light as the nights draw in!